On the fourth Saturday in May, our program will feature a history slide show and special guest Pat Richter, Class of ’59. East High athletes have earned acclaim from the start. A slideshow/history by East High alumni Dave Martinson and John Olson will be followed by memories shared by Pat Richter, teammate Steve Underwood, and others. Come prepared to share your memories of East High athletics from the 1920s-1950s. 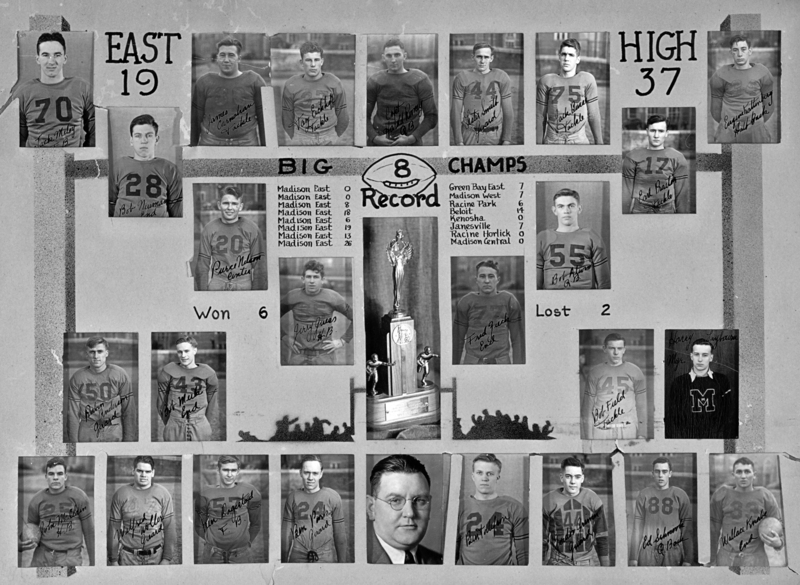 Madison East High 1937 “Big 8 Football Champs” poster courtesy of Judy Steffen. 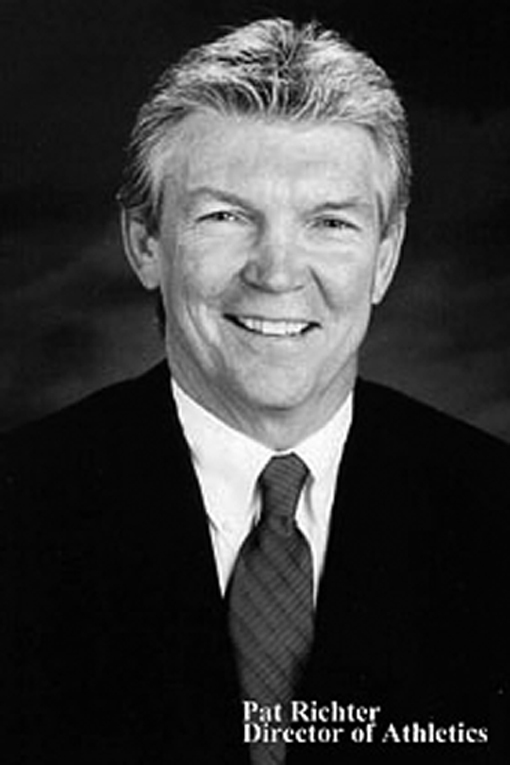 Pat Richter, W Athletic Director from 1989 to 2003. East High Class of '59. 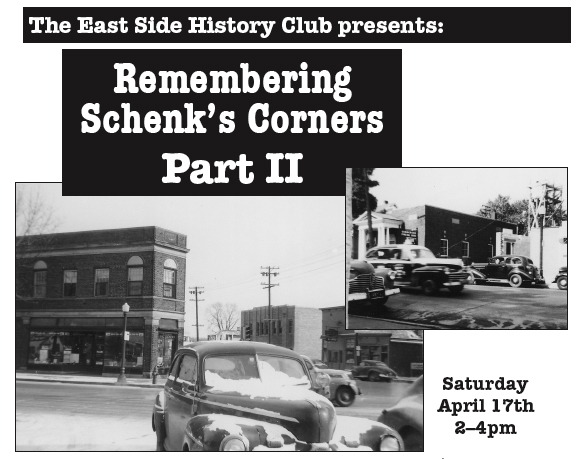 Join us to continue the discussion of the people and places that made Schenk’s Corners special through the years. (We began at our January meeting but ran out of time before everyone could participate.) Bring your memories and memorabilia to share. We’ll meet at the Goodman Community Center, 149 Waubesa Street, Saturday April 17th 2–4 pm. $2 donation welcome. Photos courtesy of Jan Foss. Left: H.C. Schenk Hardware Store, 2001 Winnebago, ca. 1951. Right: Gunderson Funeral Home, 1932 Winnebago, ca. 1947. We promised to summarize the articles Ann Waidelich read at the January meeting for the blog. Here you go! The first building on the corners was the blacksmith shop built by C.R., Amoth in 1876 at the corner of Amoth Court and Atwood Ave. Amoth’s shop served as a landmark until 1928 when it was torn down to provide room for the restaurant owned by T.C. Amoth and later sold to Grace Crabtree (now Mrs. Bob Leske). When the blacksmith shop was razed, an era went with it, for it was the last blacksmith shop east of the Yahara River. In 1893 Fred Schenk and his family came from North Leeds to open the Schenk Grocery and Tavern on the corner of Atwood and Winnebago. The intersection was to become one of the busiest corners in Madison. Fred Schenk died in 1913 and William Schenk and Art Huegel went into the grocery store business as the Schenk-Huegel Co. Many of the families kept their cows where Borenstein’s store is now (1988 Atwood at corner of 2nd St.) The streets were annually affected by the spring thaw. It took four horses to pull a cart down muddy Atwood Ave. during the wettest springs. But the trolly car went through except during heavy snows. One of the most popular spots on the corners in the early 20’s was the Palace Theater (1951Winnebago St.) with its nickel shows. It was operated by Tom Michelson until it closed in 1930. Olson’s Jewelry Store (then Elmo Peterson’s) now occupies the building. “People can’t have any idea what the corner used to be because the average person just hasn’t been here that long,” says Mrs. Wally Flagstad. “We’ve been in business here for 30 years,” she expained, “but my husband will be on his 50th year because his father had a little place over where Phyllis Collins has the Nibble Nook (2013 Atwood). Arnold and Benny Foss ran the Royal Blue, one of the independent groceries on the corner for nearly 40 years (2001 Atwood). “The store on the corner next to Flagstad’s Flower Shop has in my memory always been a grocery,” Arnold said. “My brother and I came out here in 1928. Benny was appointed manager and worked until 1932, at which time it was owned by Kroger’s. Louis Pfister, who owned the building, got together with Benny and a fellow named Larson who was the butcher at Krogers, drew up a lease and gave Krogers their 30 day notice to vacate. Benny, Larson and me moved in and got the store opened in a hurry.” Flagstad Flower Shop expanded into the old grocery in the early 1960s. Around the corner from the flower shop stands a row of stores that include Olaf Strand’s bakery (2007 Atwood) and the old Papa Joe’s restaurant (2009 Atwood).